New York, NY; Monday, February 27, 2017: The Business Summit on Ireland-U.S. Economic Relations in New York City in March will kick off with an opening night dinner on Wednesday, March 15 when the Guest Speaker will be Mick Mulvaney, Director of the Office of Management & Budget (OMB), one of the highest-ranking economic policy officials in the new Trump Administration. The event, will continue with a session on the morning of Thursday March 16 featuring many other top-ranked speakers and will conclude with the Ireland-U.S. Council’s regularly-scheduled St. Patrick’s Lunch. The event will be held at The Metropolitan Club in New York City. The event is being co-sponsored with the Ireland-U.S. Council by IBEC, Ireland’s leading business representative organization. This gathering of senior business executives and top management from enterprises on both sides of the Atlantic will be an important gathering at an important time. The forum will attract leading figures from industry and commerce on both sides of the Atlantic. The event is structured with top speakers and participants in the hope that it will provide valuable insights to signpost the way forward in further building the impressive economic relations that have been built up between Ireland and the United States. 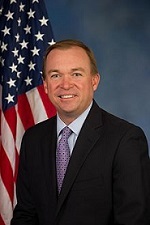 John Michael "Mick" Mulvaney was nominated as OMB director by President Donald Trump in December 2016 and confirmed by the United States Senate on February 16, 2017. He was elected to the U.S. House of Representatives in 2011 and was the first Republican since 1883 to represent South Carolina's 5th congressional district where he served until his confirmation as OMB director in 2017. He had served in the South Carolina General Assembly from 2007–2011, first in the State House of Representatives and then the State Senate. The Office of Management and Budget (OMB) is the largest office within the Executive Office of the President of the United States (EOP). OMB’s most prominent function is to produce the President’s Budget, but OMB also measures the quality of agency programs, policies, and procedures to see if they comply with the president’s policies and coordinates inter-agency policy initiatives. The OMB Director reports to the President (Donald Trump), Vice President (Mike Pence) and the White House Chief of Staff (Reince Priebus). OMB prepares the President’s budget proposal to Congress and supervises the administration of the executive branch agencies. OMB has control over the budgetary approval process of all cabinets. OMB evaluates the effectiveness of agency programs, policies, and procedures, assesses competing funding demands among agencies, and sets funding priorities. OMB ensures that agency reports, rules, testimony, and proposed legislation are consistent with the president’s budget and with administration policies. OMB also oversees and coordinates the administration’s procurement, financial management, information, and regulatory policies. In each of these areas, OMB’s role is to help improve administrative management, to develop better performance measures and coordinating mechanisms, and to reduce any unnecessary burdens on the public. Click here for more information on attending the Business Summit on Ireland-U.S. Economic Relations in New York City on March 15-16.